It's easier to make connections, and you have new avenues to follow, which can lead to success in your professional life. You're ready for something different and can create changes on many different levels. Your physical vitality improves, although you may feel self-indulgent early in the month. Improve your game by visualizing, but you'll never know how far you've come until you get on the playing field! The influences of Venus and Uranus play a significant role in helping you to break out of tired routine and open up to something more experimental in your love life. Surface changes are not enough: you want something electrifying, and may find yourself suddenly attracted to someone from the 1st—6th. You can use this same energy to revitalize a solid relationship. 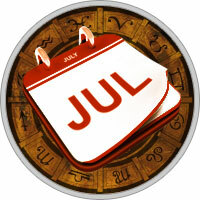 You'll feel more steady after the 12th, when at least a temporary commitment can feel OK. Your talents and creative abilities work to your advantage. You may even be able to diversify or to incorporate innovative changes which set you apart from your competition. Travel can be beneficial, and can strengthen your widening influence. If you need to market or advertise, try a new campaign following the Moon on the 4th. Investments are most promising from the 12th—25th, but avoid gambling unless you can afford the risk. Unusual, experimental or innovative changes can work to your advantage from the 1st—11th, as long as they can be incorporated without totally disrupting the flow of progress.